Starting a new project is one of the most exciting things in my world. There is so much to learn and always interesting challenges along the way. 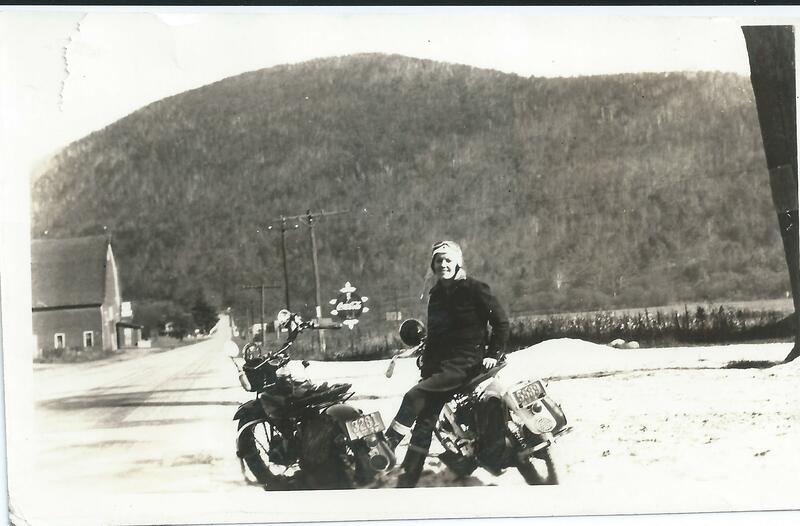 This book has the working title of IRON HORSE COWGIRLS: Women Motorcyclists of the 1930s and 1940s. Many years ago I “inherited” an extensive collection of vintage snapshots. 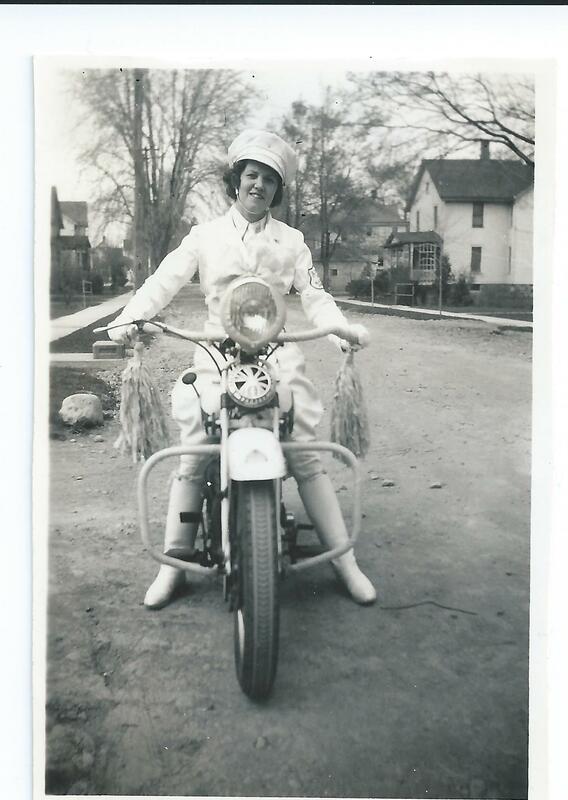 The photos had been taken and collected by an early woman biker named Louise Scherbyn. 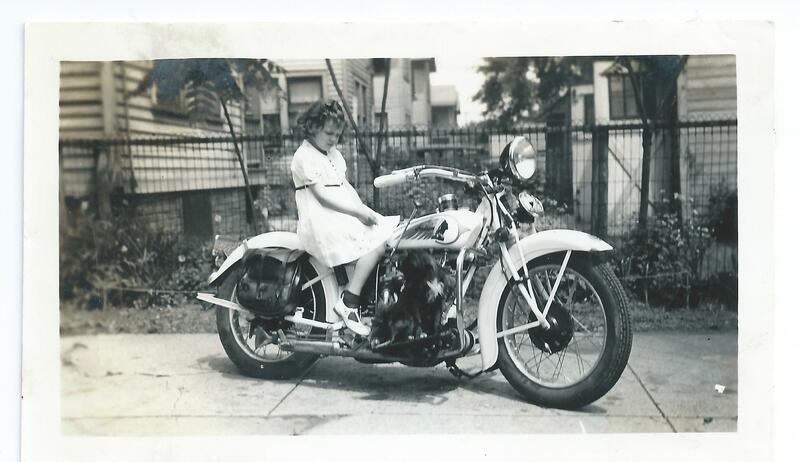 Louise loved everything about riding and motorcycles. 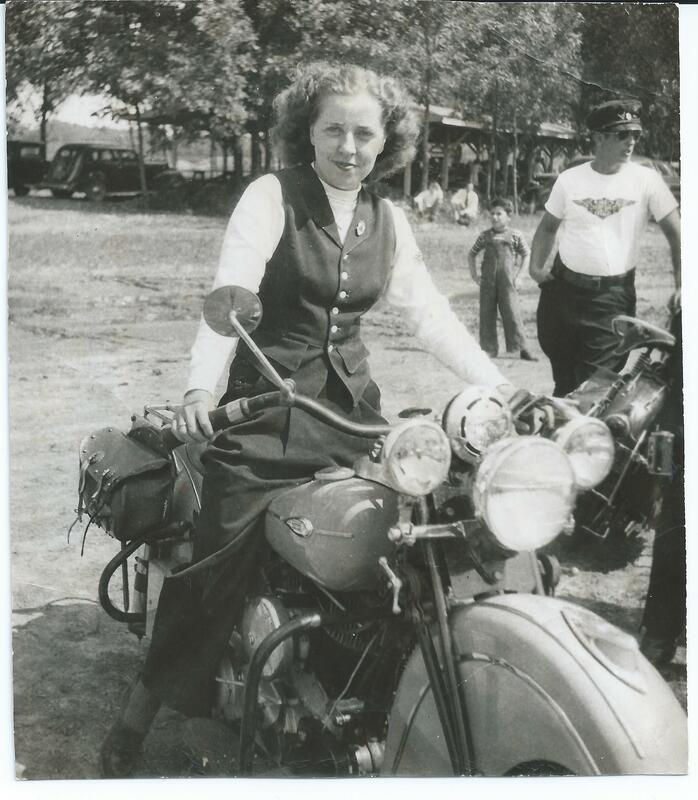 She not only founded Women’s International Motorcycle Association (WIMA), but she was a great collector of motorcycle paraphernalia, much of which is currently at the Indian Motorcycle Museum in Springfield, Massachusetts. These 600+ photos have been in my possession for a long time but I confess to never having really looked at them all until I decided to put this book together. Notice the junior Iron Horse Cowgirl above? You can tell that she is wistfully dreaming of the day she’ll be able to ride off by herself into the sunset. This is one of my favorite photos of the collection, maybe because it’s “colorized.” This women’s motorcycle club was called the “Tag-a-Longs.” Is that because they tended to tag along with the boys on rides? And whatever happened to Jodhpurs? They made so much sense for riders of all types. I covet the boots. 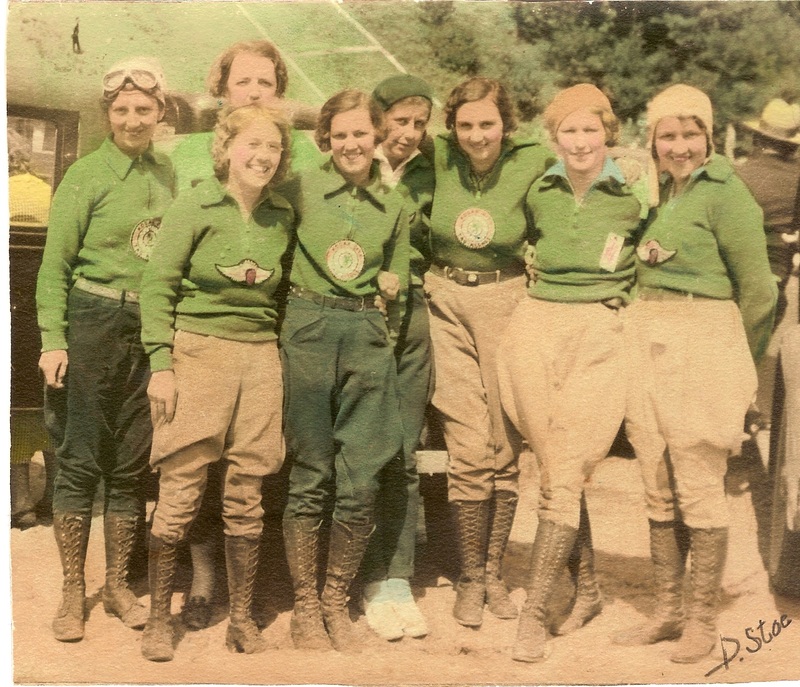 Goggles and aviator caps were the precursors to today’s helmets, but it worked for them. Strong, courageous and beautiful women! Many of the photos show what city and town life was like back then. I’m working to include some historical detail, like the WPA, the War in Europe, bombing of Pearl Harbor and World War II as well as some other facts of the era. It’s so interesting to let these photos tell me their stories. My job is to allow this to happen. Oh, and to build my audience on social media. But that’s a whole other blog! I am currently teaching a class titled “To Publish and Present.” Many people are intimidated with the whole idea of taking charge regarding the precious work you have produced over a number of years. This is meant as some practical advice. It might look overwhelming at first, but take one step at a time and your book will be successfully launched into the world. 1. Make sure there are no typos or clunky parts in the book. It’s a good idea to hire a professional proofreader, since the author is usually the worst person to do this task. 4. Prepare your “elevator statement” (the short version – what this book is about, why it’s important.) This is your key marketing message. 5. Prepare your longer remarks based on your elevator statement. 6. Research your niche (adoption, reunion, open adoption, healing…) You can do virtually all of this on the internet. Email everyone with your pitch. Offer to give readings and presentations and lead discussions. 7. Practice the things you’ll be offering. If you have a longsuffering husband like I do, practice on him. 8. Keep an ongoing list of places to send review copies. These are people who might review your book, or use it in another way – with clients, colleagues or associates. You will be sending out free books, but make sure the recipients know that they are helping you get the book into the world. 9. Get a head shot taken and have it handy in your computer. 10. Write a powerful press release and have it handy in your computer. 12. Have the book cover handy in your computer. 13. Start lining up readings when you know the exact publication date. Many bookstores book authors months in advance. Contact stores where you travel, where you have family and friends… anyone who can help you get an audience. Typically, you approach the store with an email that contains your book description, with head shot, cover and press release attached. I love to support the indies. Common Good Books, SubText, Bookcase in Wayzata, Mikawbers, Magers & Quinn, Drury Lane Books in Grand Marais, etc. Notice bookstores wherever you go. Wander in and talk to the owners or managers about your book. Ask them if they would like to carry it or take some copies on consignment. (You get paid, minus the standard 40% discount, if they sell them.) Consignment is good for the small stores because there is no risk. 1. Send out all your review copies. Follow up with a phone call and/or email. Don’t be afraid to ask the local newspapers to review your book. Contact the little neighborhood papers and tell them about your new book. Suggest they do a little article about you. They usually appreciate any new content. 2. Keep booking readings, but be careful not to do too many in the same area. You need to make sure you have an audience. A good way to do this is to team up with another author (one who has a good following) and pitch both authors to the bookstore. 3. Talk to everyone about your book and ask them to help you get it into the world. 4. My friend, the highly successful and generous Warren Hanson (A Cup of Christmas Tea, The Next Place, etc.) sends an extra book to anyone who orders his book. I have tried this, too. I say, “Either give it to someone who needs it or give it to someone who can help it get into the world.” Being generous is good. Plus it’s good for the karma. 5. Contact book groups and offer to appear for a free reading and discussion. (If they do your book, they have to buy copies to read it.) These can be very good gigs. 6. Now that you’ve had some experience talking and writing about your book, contact radio and TV stations. Any station that has a talk segment. You can do much of this via email. Send them your pitch material. Make sure you have a “call to action” for interviews. An 800# or easy email, website or some easy way for people to get your book. You mention that twice toward the end of the interview. 7. Check out book festivals and, if it makes sense, buy a table or share one with another author with a similar or complementary book. 2. Talk to everyone about your book. You never know who might know someone who knows someone who can help you. 3. Go everywhere. Always say yes. 5. Create a following. Do a blog on your website. Or do a whole new website for this book. 6. Propose a workshop session for a conference. Write articles for adoption-related magazines (Adoption Today and Adoptive Families) with excerpts from your book and your website. 7. Be a guest blogger for other sites, with a lively and informative article (of course, quoting or mentioning your book.) There is a vast universe on the internet. You could write a form letter offering to guest blog and blind copy it to a bunch of adoption-related sites. 8. Talk to birth parents, adoptive parents and adoptees – all sides of the adoption triad. Be a friend to all.